Whenever you need help on a specific topic, you can access the corresponding page in the current User Manual via the Help button available in most dialogs — please note that third-party plugins can point to dedicated web pages. By default, QGIS provides many panels to work with. Some of these panels are described below while others may be found in different parts of the document. A complete list of default panels provided by QGIS is available via the View ‣ Panels ‣ menu and mentioned at Panels. The Layers panel (also called the map legend) lists all the layers in the project and helps you manage their visibility. You can show or hide it by pressing Ctrl+1. A layer can be selected and dragged up or down in the legend to change the Z-ordering. Z-ordering means that layers listed nearer the top of the legend are drawn over layers listed lower down in the legend. Open the layer styling dock (F7): toggle the layer styling panel on and off. Manage Map Themes: control visibility of layers and arrange them in different map themes. Filter Legend by Expression: apply an expression to remove styles from the selected layer tree that have no feature satisfying the condition. This can be used to highlight features that are within a given area/feature of another layer. From the drop-down list, you can edit and clear the expression currently applied. A map theme does not remember the current details of the properties: only a reference to the style name is saved, so whenever you apply modifications to the layer while this style is enabled (eg change the symbology rendering), the map theme is updated with new information. The new theme is listed in the lower part of the drop-down menu. You can create as many map themes as you need: whenever the current combination in the map legend (visible layers, their active style, the map legend nodes) does not match any existing map theme contents as defined above, click on Add Theme… to create a new map theme, or use Replace Theme ‣ to update the current map theme. Use the Remove Current Theme button to delete the active theme. Map themes are helpful to switch quickly between different preconfigured combinations: select a map theme in the list to restore its combination. All configured themes are also accessible in the print layout, allowing you to create a map layout based on specific themes (see Main properties). At the bottom of the toolbar, the main component of the Layers panel is the frame listing vector or raster layers added to the project, optionally organized in groups. Depending on the item selected in the panel, a right-click shows a dedicated set of options presented below. For GRASS vector layers, Toggle editing is not available. See section Digitizing and editing a GRASS vector layer for information on editing GRASS vector layers. Select some layers, right-click in the legend window and choose Group Selected. The selected layers will automatically be placed in a new group. To move a layer out of a group, drag it out, or right-click on it and choose Move Out of Group: the layer is moved from the group and placed above it. Groups can also be nested inside other groups. If a layer is placed in a nested group, Move Out of Group will move the layer out of all nested groups. To move a group or layer to the top of the layer panel, either drag it to the top, or choose Move to Top. If you use this option on a layer nested in a group, the layer is moved to the top in its current group. Enabling the Mutually Exclusive Group option means you can make a group have only one layer visible at the same time. Whenever a layer within the group is set visible the others will be toggled not visible. It is possible to select more than one layer or group at the same time by holding down the Ctrl key while clicking additional layers. You can then move all selected layers to a new group at the same time. You may also delete more than one layer or group at once by selecting several items with the Ctrl key and then pressing Ctrl+D: all selected layers or groups will be removed from the layers list. to remind you that the layer is a temporary scratch layer and its content will be discarded when you close this project. To avoid data loss and make the layer permanent, click the icon to store the layer in any of the OGR vector formats supported by QGIS. see the styles currently applied to the layer. If you defined many styles for the layer, you can switch from one to another and your layer rendering will automatically be updated on the map canvas. rename the current style, add a new style (which is actually a copy of the current one) or delete the current style (when multiple styles are available). The previous options are also available for raster layers. Edit Symbol… to open the The Symbol Selector dialog to change any properties of the layer or feature symbol (symbol, size, color…). Double-clicking on a feature also opens the Symbol Selector dialog. Color Selector with a Color Wheel from which you can click a color to update the symbol fill color automatically. For convenience, Recent colors are available at the bottom of the color wheel. Show All Items and Hide All Items to toggle on or off the visibility of all the classes of features. This avoids (un)checking items one by one. From the context menu, copy the style of a layer and paste it to a group or a selection of layers: the style is applied to all the layers that are of the same type (vector/raster) as the original layer and, for vector layers, have the same geometry type (point, line or polygon). The Layer Styling panel (also enabled with Ctrl+3) is a shortcut to some of the functionalities of the Layer Properties dialog. It provides a quick and easy way to define the rendering and the behavior of a layer, and to visualize its effects without haveing to open the layer properties dialog. In addition to avoiding the blocking (or “modal”) layer properties dialog, the layer styling panel also avoids cluttering the screen with dialogs, and contains most style functions (color selector, effects properties, rule edit, label substitution…): e.g., clicking color buttons inside the layer style panel causes the color selector dialog to be opened inside the layer style panel itself rather than as a separate dialog. Set raster layer Symbology, Transparency, and Histogram properties. These options are the same as those in the Raster Properties Dialog. Set vector layer Symbology, 3D View and Labels properties. These options are the same as those in the The Vector Properties Dialog. Manage the associated style(s) in the Style Manager (more details at Managing Custom Styles). See the History of changes you applied to the layer style in the current project: you can therefore cancel or restore to any state by selecting it in the list and clicking Apply. Another powerful feature of this panel is the Live update checkbox. Tick it to render your changes immediately on the map canvas: you no longer need to click the Apply button. 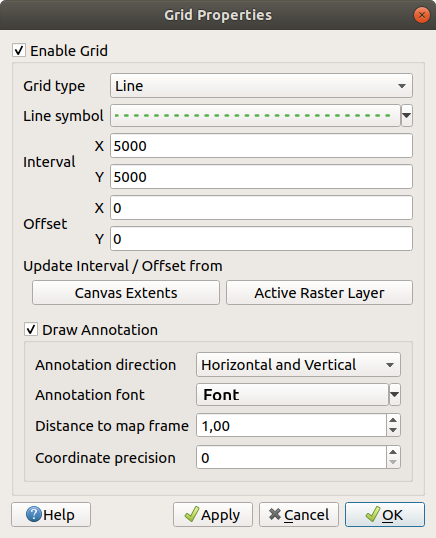 By default, layers shown on the QGIS map canvas are drawn following their order in the Layers panel: the higher a layer is in the panel, the higher (hence, more visible) it’ll be in the map view. You can define a drawing order for the layers independent of the order in the layers panel with the Layer Order panel enabled in View ‣ Panels ‣ menu or with Ctrl+9. Check Control rendering order underneath the list of layers and reorganize the layers in the panel as you want. This order becomes the one applied to the map canvas. 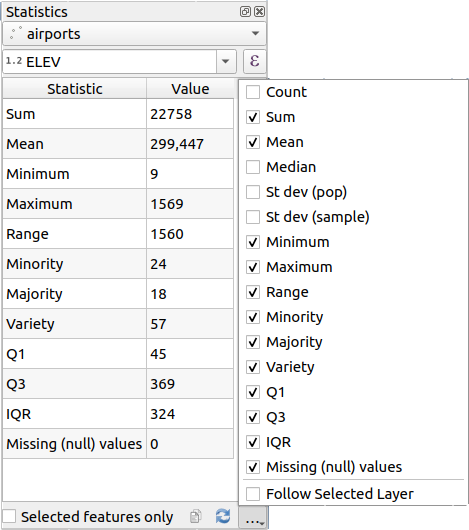 For example, in figure_layer_order, you can see that the airports features are displayed over the alaska polygon despite those layers’ respective placement in the Layers panel. Unchecking Control rendering order will revert to default behavior. The Overview panel (Ctrl+8) displays a map with a full extent view of some of the layers. The Overview map is filled with layers using the Show in Overview option from the Layer menu or in the layer contextual menu. Within the view, a red rectangle shows the current map canvas extent, helping you quickly to determine which area of the whole map you are currently viewing. If you click-and-drag the red rectangle in the overview frame, the main map view extent will update accordingly. Note that labels are not rendered to the map overview even if the layers used in the map overview have been set up for labeling. For each layer being edited, the Undo/Redo (Ctrl+5) panel shows the list of actions carried out, allowing you quickly to undo a set of actions by selecting the action listed above. More details at Undo and Redo edits. Sometimes, you’d like to keep some layers in different projects, but with the same style. You can either create a default style for these layers or embed them from another project to save time and effort. The selected layers and groups are embedded in the Layers panel and displayed on the map canvas. An icon is added next to their name for recognition and hovering over displays a tooltip with the original project file path. Like any other layer, an embedded layer can be removed from the project by right-clicking on the layer and clicking Remove. It’s not possible to change the rendering of an embedded layer, unless you make the changes in the original project file. However, right-clicking on a layer and selecting Duplicate creates a layer which is fully-featured and not dependent on the original project. You can then safely remove the linked layer. 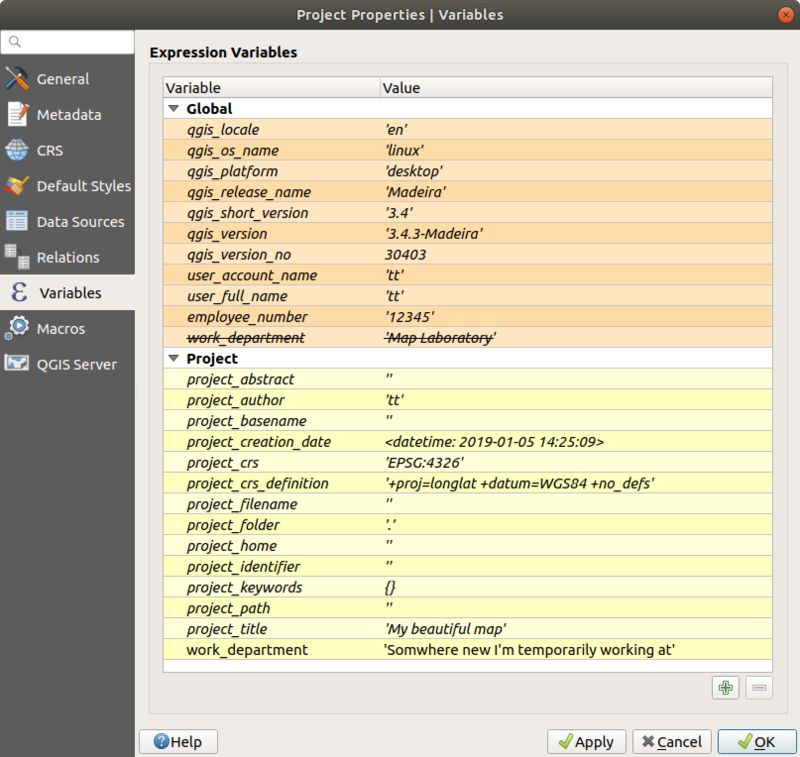 QGIS allows you to control the rendering process in a number of ways. Scale-dependent rendering allows you to specify the minimum and maximum scales at which a layer (raster or vector) will be visible. To set scale-dependent rendering, open the Properties dialog by double-clicking on the layer in the legend. On the Rendering tab, tick Scale dependent visibility and enter the Minimum (exclusive) and Maximum (inclusive) scale values. You can also activate scale dependent visibility on a layer from the Layers panel. Right-click on the layer and in the context menu, select Set Layer Scale Visibility. The Set to current canvas scale button allow you to use the current map canvas scale as boundary of the range visibility. When a layer is not rendered in the map canvas because the map scale is out of its visibility scale range, the layer is greyed in the Layers panel and a new option Zoom to Visible Scale appears in the layer context menu. Select it and the map is zoomed to the layer’s nearest visibility scale. Checking the Render checkbox enables rendering and causes an immediate refresh of the map canvas. You can set an option to always load new layers without drawing them. This means the layer will be added to the map, but its visibility checkbox in the legend will be unchecked by default. To set this option, choose menu option Settings ‣ Options and click on the Rendering tab. Uncheck By default new layers added to the map should be displayed. Any layer subsequently added to the map will be off (invisible) by default. To stop the map drawing, press the Esc key. This will halt the refresh of the map canvas and leave the map partially drawn. It may take a bit of time between pressing Esc for the map drawing to halt. It is currently not possible to stop rendering — this was disabled in the Qt4 port because of User Interface (UI) problems and crashes. Use render caching where possible to speed up redraws. With Enable Feature simplification by default for newly added layers, you simplify features’ geometry (fewer nodes) and as a result, they display more quickly. Be aware that this can cause rendering inconsistencies. Apart from using the pan and zoom-in/ zoom-out icons on the toolbar with the mouse, you can also navigate with the mouse wheel, spacebar and arrow keys. A Zoom factor can be set under the Settings ‣ Options ‣ Map tools menu to define the scale behavior while zooming. You can press the mouse wheel to pan inside of the main window (on macOS, you may need to hold down the cmd key). You can roll the mouse wheel to zoom in and out on the map; the mouse cursor position will be the center of the zoomed area of interest. Holding down Ctrl while rolling the mouse wheel results in a finer zoom. Panning the map is possible with the arrow keys. Place the mouse cursor inside the map area, and click on the arrow keys to pan up, down, left and right. You can also use the space bar to cause mouse movements temporarily to pan the map. The PgUp and PgDown keys on your keyboard will cause the map display to zoom in or out following the zoom factor set. Pressing Ctrl++ or Ctrl+- also performs an immediate zoom in/out on the map canvas. When certain map tools are active (Identify, Measure…), you can perform a zoom by holding down Shift and dragging a rectangle on the map to zoom to that area. This is not enabled for selection tools (since they use Shift for adding to selection) or edit tools. Zoom or pan to the area of interest. Select the menu option View ‣ New Bookmark or press Ctrl+B. The Spatial Bookmarks panel opens with the newly created bookmark. Enter a descriptive name for the bookmark (up to 255 characters). Note that you can have multiple bookmarks with the same name. Import or Export a bookmark: To share or transfer your bookmarks between computers you can use the Import/Export Bookmarks drop-down menu to export all bookmarks to an .xml file or import bookmarks from such a file. You can also zoom to saved bookmarks by typing the bookmark name in the locator. Decorations include Grid, Copyright Label, North Arrow, Scale Bar and Layout Extents. They are used to ‘decorate’ the map by adding cartographic elements. 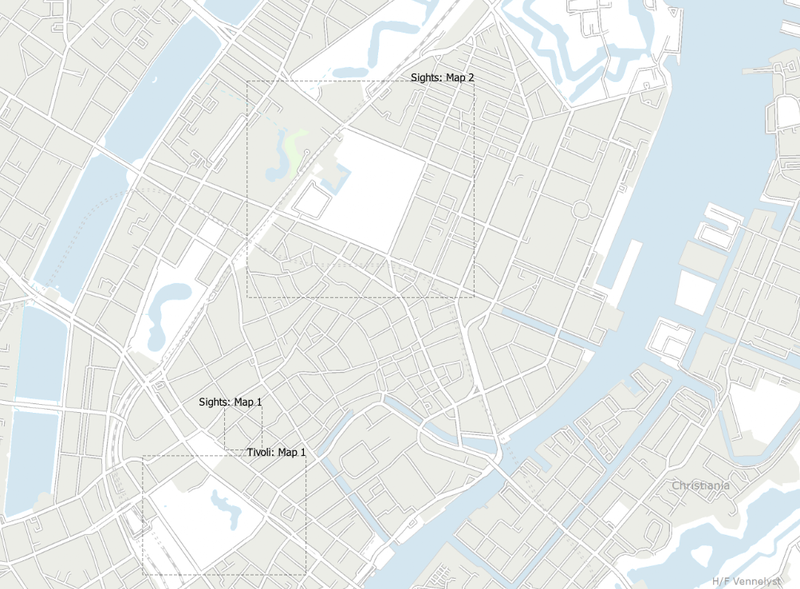 Grid allows you to add a coordinate grid and coordinate annotations to the map canvas. Select View ‣ Decorations ‣ Grid to open the dialog. Tick Enable grid and set grid definitions according to the layers loaded in the map canvas. Tick Draw annotations and set annotation definitions according to the layers loaded in the map canvas. Click Apply to verify that it looks as expected or OK if you’re satisfied. Copyright label adds a copyright label to the map using your choice of text. Make sure Enable Copyright Label is checked. Enter the text you want to place on the map. You can include expressions (using the Insert an Expression button). Choose the font for the label from the Font combo box. Set the font color and opacity by clicking the black arrow to the right of the font combo box. Choose the placement of the label from the Placement combo box. Refine the placement of the item by setting a horizontal and/or vertical Margin from Edge. These values can be in Millimeters or Pixels or set as a Percentage of the width or height of the map canvas. 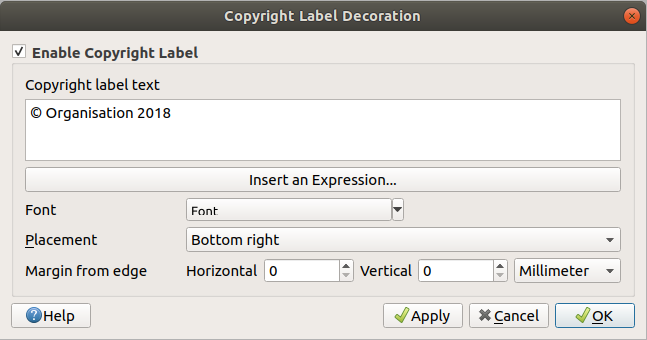 In the example above, which is the default, QGIS places a copyright symbol followed by the date in the bottom-right corner of the map canvas. North Arrow adds a north arrow on the map canvas, with options for style and placement. Select View ‣ Decorations ‣ North Arrow to open the dialog. Optionally change the color and size, or choose a custom SVG. Optionally refine the placement of the arrow by setting a horizontal and/or vertical Margin from (Canvas) Edge . These values can be in Millimeters or Pixels or set as a Percentage of the width or height of the map canvas. Click Apply to verify that it looks as expected and OK if you’re satisfied. 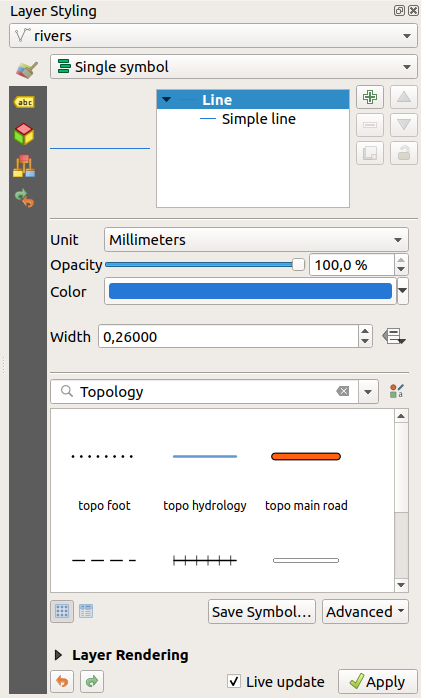 QGIS only supports displaying the scale in the same units as your map frame. So, if the units of your project’s CRS are meters, you can’t create a scale bar in feet. Likewise, if you are using decimal degrees, you can’t create a scale bar to display distance in meters. Select the Color of bar by choosing a fill color (default: black) and an outline color (default: white). 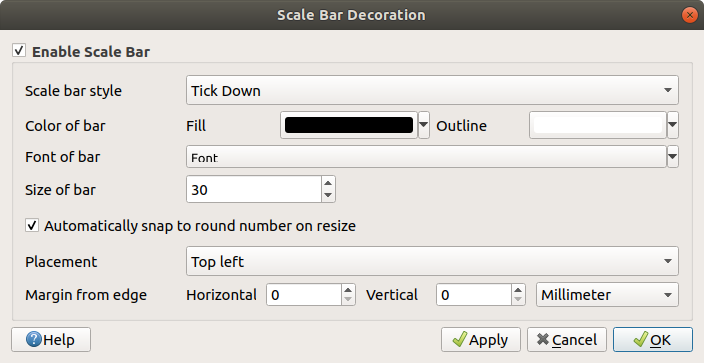 The scale bar fill and outline can be made opaque by clicking on the down arrow to the right of the color input. You can refine the placement of the item by setting a horizontal and/or vertical Margin from (Canvas) Edge . These values can be in Millimeters or Pixels or set as a Percentage of the width or height of the map canvas. Layout Extents adds the extents of map item(s) in print layout(s) to the canvas. When enabled, the extents of all map items within all print layouts are shown using a lightly dotted border labeled with the name of the print layout and map item. You can control the style and labeling of the displayed layout extents. This decoration is useful when you are tweaking the positioning of map elements such as labels, and need to know the actual visible region of print layouts. 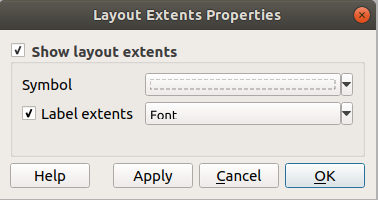 Example of layout extents displayed in a QGIS project with two print layouts. The print layout named ‘Sights’ contains two map items, while the other print layout contains one map item. When you save a QGIS project file, any changes you have made to Grid, North Arrow, Scale Bar, Copyright and Layout Extents will be saved in the project and restored the next time you load the project. Form Annotation: useful to display attributes of a vector layer in a customized ui file (see figure_custom_annotation). This is similar to the custom attribute forms, but displayed in an annotation item. Also see this video https://youtu.be/0pDBuSbQ02o?t=2m25s from Tim Sutton for more information. At the top, a file selector to fill with the path to an html, svg or ui file depending on the type of annotation. For text annotation, you can enter your message in a text box and set its rendering with the normal font tools. Fixed map position: when unchecked, the balloon placement is based on a screen position (instead of the map), meaning that it’s always shown regardless the map canvas extent. Linked layer: associates the annotation with a map layer, making it visible only when that layer is visible. Map marker: using QGIS symbols, sets the symbol to display at the balloon anchor position (shown only when Fixed map position is checked). Frame style: sets the frame background color, transparency, stroke color or width of the balloon using QGIS symbols. Contents margins: sets interior margins of the annotation frame. Annotations can be selected when an annotation tool is enabled. They can then be moved by map position (by dragging the map marker) or by moving only the balloon. The Move Annotation tool also allows you to move the balloon on the map canvas. To delete an annotation, select it and either press the Del or Backspace button, or double-click it and press the Delete button in the properties dialog. If you press Ctrl+T while an Annotation tool (move annotation, text annotation, form annotation) is active, the visibility states of the items are inverted. 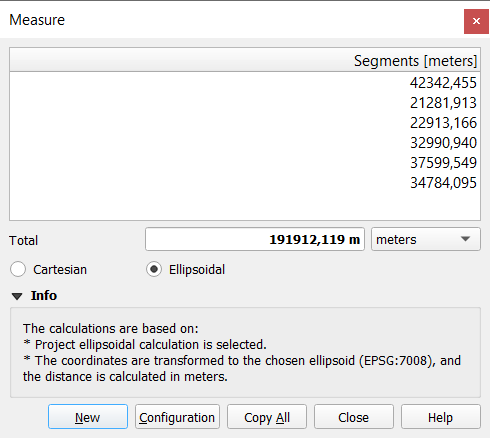 Unlike most other GIS, the default measurement metric is ellipsoidal, using the ellipsoid defined in Project ‣ Properties… ‣ General. This is true both when geographic and projected coordinate systems are defined for the project. If you want to calculate the projected/planimetric area or distance using cartesian maths, the measurement ellipsoid has to be set to “None/Planimetric” (Project ‣ Properties… ‣ CRS). However, with a geographic (ie unprojected) CRS defined for the data and project, area and distance measurement will be ellipsoidal. However, neither the identify tool nor the field calculator will transform your data to the project CRS before measuring. If you want to achieve this, you have to use the vector analysis tool: Vector ‣ Geometry Tools ‣ Add Geometry Attributes…. Here, measurement is planimetric, unless you choose the ellipsoidal measurement. Click the icon in the Attribute toolbar to begin measurements. The down arrow near the icon switches between length, area or angle. The default unit used in the dialog is the one set in Project ‣ Properties… ‣ General menu. While measuring length or area, clicking the Configuration button at the bottom of the widget opens the Settings ‣ Options ‣ Map Tools menu, where you can select the rubberband color, the precision of the measurements and the unit behavior. You can also choose your preferred measurement or angle units, but keep in mind that those values are overridden in the current project by the selection made in the Project ‣ Properties… ‣ General menu, and by the selection made in the measurement widget. All measuring modules use the snapping settings from the digitizing module (see section Setting the Snapping Tolerance and Search Radius). So, if you want to measure exactly along a line feature, or around a polygon feature, first set its layer snapping tolerance. Now, when using the measuring tools, each mouse click (within the tolerance setting) will snap to that layer. By default, Measure Line measures real distances between given points according to a defined ellipsoid. The tool then allows you to click points on the map. Each segment length, as well as the total, shows up in the measure window. To stop measuring, click the right mouse button. Note that you can use the drop-down list near the total to change the measurement units interactively while working with the measure tool (‘Meters’, ‘Kilometers’, ‘Feet’, ‘Yards’, ‘Miles’, ‘Nautical miles’, ‘Centimeters’, ‘Millimeters’, ‘Degrees’, ‘Map units’). This unit is retained for the widget until a new project is created or another project is opened. 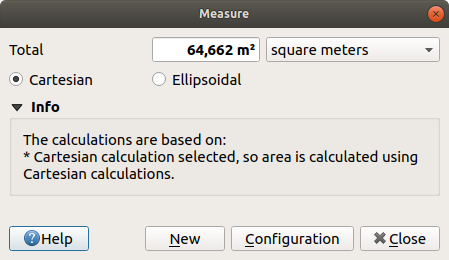 The Info section in the dialog explains how calculations are made according to the CRS settings available. Measure Area: Areas can also be measured. In the measure window, the accumulated area size appears. Right-click to stop drawing. The Info section is also available as well as the ability to switch between different area units (‘Square meters’, ‘Square kilometers’, ‘Square feet’, ‘Square yards’, ‘Square miles’, ‘Hectares’, ‘Acres’, ‘Square centimeters’, ‘Square millimeters’, ‘Square nautical miles’, ‘Square degrees’, ‘Map units’). Measure Angle: You can also measure angles. The cursor becomes cross-shaped. Click to draw the first segment of the angle you wish to measure, then move the cursor to draw the desired angle. The measurement is displayed in a pop-up dialog. 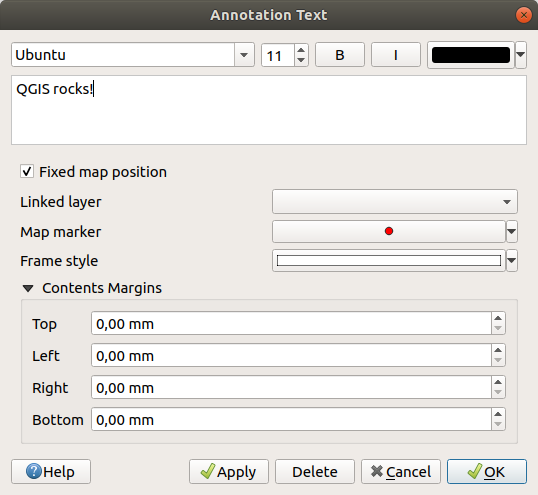 QGIS provides several tools to select features on the map canvas. Selection tools are available in the View ‣ Select menu or in the Attributes toolbar. Other than Select Features by Polygon, these manual selection tools allow you to select feature(s) on the map canvas with a single click. Use the Select Features by Polygon tool to use an existing polygon to select overlapping features. Right-click in the polygon and choose it from the context menu that shows a list of all the polygons that contain the clicked point. All the overlapping features from the active layer are selected. While using the Select Feature(s) tool, holding Shift or Ctrl toggles whether a feature is selected (ie either adds to the current selection or remove from it). Alt: select features that are totally within the selection shape. Combined with Shift or Ctrl keys, you can add or substract features to/from the current selection. From the expression builder dialog, you can also use Function list ‣ Recent (Selection) to make a selection that you have used before. The dialog remembers the last 20 expressions used. See Expressions for more information and examples. Users can save selected features into a New Temporary Scratch Layer or a New Vector Layer using Edit ‣ Copy Features and Edit ‣ Paste Features as in the desired format. This selection tool opens the layer’s feature form allowing the user to choose which value to look for for each field, whether the search should be case-sensitive, and the operation that should be used. The tool has also autocompletes, automatically filling the search box with existing values. For string comparisons, it is also possible to use the Case sensitive option. You can also clear all search options using the Reset form button. Flash features, highlighting the matching features. This is a handy way to identify a feature without selection or using the Identify tool. Note that the flash does not alter the map canvas extent and would be visible only if the feature is within the bounds of the current map canvas. 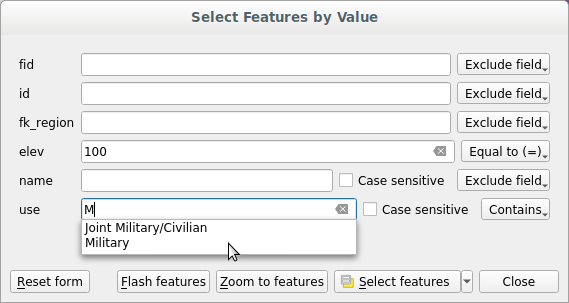 right click with Identify Feature(s) as selection mode set in the Identify Results panel fetches all snapped features from all visible layers. This opens a context menu, allowing the user to choose more precisely the features to identify or the action to execute on them. Under Layer Capabilities in Project ‣ Properties… ‣ Data Sources, uncheck the Identifiable column next to a layer to avoid it being queried when using the Identify Features tool in a mode other than Current Layer. This is a handy way to return features from only layers that are of interest for you. If you click on feature(s), the Identify Results dialog will list information about the feature(s) clicked. The default view is a tree view in which the first item is the name of the layer and its children are its identified feature(s). Each feature is described by the name of a field along with its value. This field is the one set in Layer Properties ‣ Display. All the other information about the feature follows. Actions: Actions can be added to the identify feature windows. The action is run by clicking on the action label. By default, only one action is added, namely View feature form for editing. You can define more actions in the layer’s properties dialog (see Actions Properties). if you click on a curved segment, the radius of that section is also displayed. Links in the feature’s attributes are clickable from the Identify Results panel and will open in your default web browser. When using Identify Features by Polygon, you can right-click any existing polygon and use it to identify overlapping features in another layer. Current layer: only features from the selected layer are identified. The layer need not be visible in the canvas. Top down, stop at first: only features from the upper visible layer. Top down: all features from the visible layers. The results are shown in the panel. Layer selection: opens a context menu where the user selects the layer to identify features from, similar to a right-click. Only the chosen features will be shown in the result panel. The identify tool allows you to Auto open form. If checked, each time a single feature is identified, a form opens showing its attributes. This is a handy way to quickly edit a feature’s attributes. When a vector layer is added to the map canvas, QGIS by default uses a random symbol/color to render its features. However, you can set a default symbol in Project ‣ Properties… ‣ Default styles that will be applied to each newly added layer according to its geometry type. Most of the time, though, you’d rather have a custom and more complex style that can be applied automatically or manually to the layers (with less effort). You can achieve this by using the Style menu at the bottom of the Layer Properties dialog. This menu provides you with functions to create, load and manage styles. A style stores any information set in the layer properties dialog to render or interact with the layer (including symbology, labeling, fields and form definitions, actions, diagrams…) for vector layers, or the pixels (band or color rendering, transparency, pyramids, histogram …) for raster. At the bottom of the Style drop-down list, you can see the styles set for the layer with the active one checked. Note that each time you validate the layer properties dialog, the active style is updated with the changes you’ve made. You can create as many styles as you wish for a layer but only one can be active at a time. In combination with Map Themes, this offers a quick and powerful way to manage complex projects without the need to duplicate any layer in the map legend. Given that whenever you apply modifications to the layer properties, changes are stored in the active style, always ensure you are editing the right style to avoid mistakenly altering a style used in a map theme. Right-click on the layer in the Layers panel to add, rename or remove layer styles. While styles created from the Style combobox are by default saved inside the project and can be copied and pasted from layer to layer in the project, it’s also possible to save them outside the project so that they can be loaded in another project. Used on file-based format layers (.shp, .tab…), Save as Default generates a .qml file for the layer (with the same name). SLDs can be exported from any type of renderer – single symbol, categorized, graduated or rule-based – but when importing an SLD, either a single symbol or rule-based renderer is created. This means that categorized or graduated styles are converted to rule-based. If you want to preserve those renderers, you have to use the QML format. On the other hand, it can be very handy sometimes to have this easy way of converting styles to rule-based. Vector layer styles can also be stored in a database if the layer datasource is a database provider. 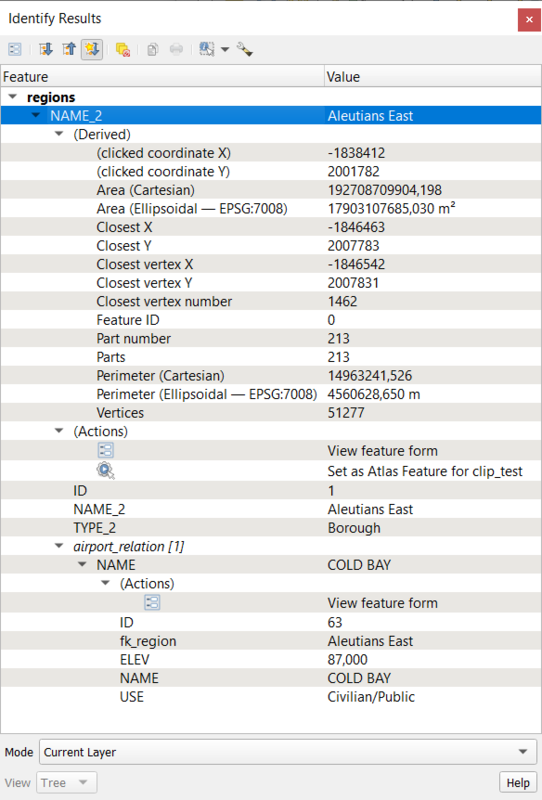 Supported formats are PostGIS, GeoPackage, SpatiaLite, MSSQL and Oracle. The layer style is saved inside a table (named layer_styles) in the database. Click on Save Style… ‣ Save in database then fill in the dialog to define a style name, add a description, a .ui file if applicable and to check if the style should be the default style. You can save several styles for a single table in the database. However, each table can have only one default style. 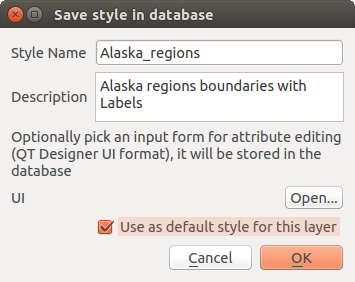 Default styles can be saved in the layer database or in the QGIS local database, a SQLite database in the ~/.qgis2/ directory (where QGIS stores its local settings). You may encounter issues restoring the layer_styles table from a PostgreSQL database backup. Follow QGIS layer_style table and database backup to fix that. 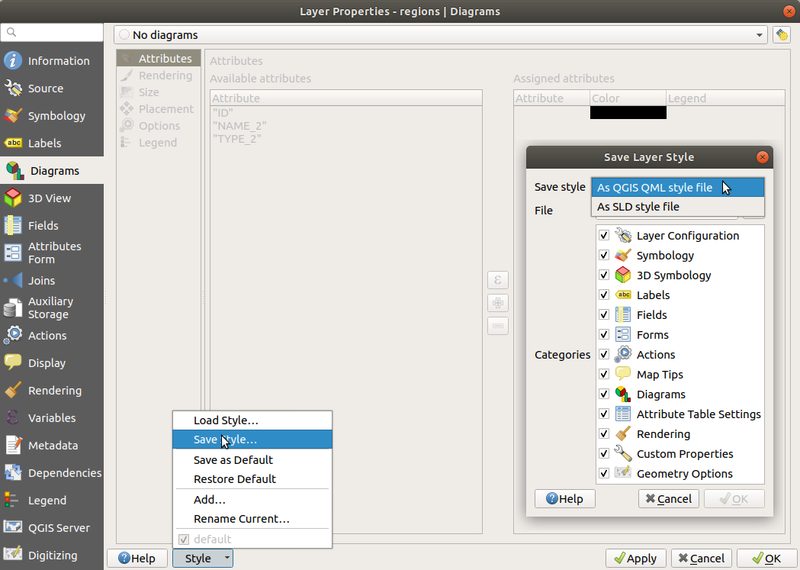 When loading a layer in QGIS, if a default style already exists for this layer, QGIS loads the layer with this style. Also Style ‣ Restore Default looks for and loads that file, replacing the layer’s current style. Style ‣ Load Style helps you apply any saved style to a layer. While text-file styles (.sld or .qml) can be applied to any layer whatever its format, loading styles stored in a database is only possible if the layer is from the same database or the style is stored in the QGIS local database. The Database Styles Manager dialog displays a list of styles related to the layer found in the database and all the other styles saved in it, with name and description. You can also share layer styles within a project without importing a file or database style: right-click on the layer in the Layers Panel and, from the Styles combobox , copy the style of a layer and paste it to a group or a selection of layers: the style is applied to all the layers that are of the same type (vector vs raster) as the original layer and, in the case of vector layers, have the same geometry type (point, line or polygon). Layer definitions can be saved as a Layer Definition File (.qlr) using Export ‣ Save As Layer Definition File… in the active layers’ context menu. A layer definition file (.qlr) includes references to the data source of the layers and their styles. .qlr files are shown in the Browser Panel and can be used to add the layers (with the saved style) to the Layers Panel. You can also drag and drop .qlr files from the system file manager into the map canvas. and layout item variables from the Item Properties panel in the Print layout (see Layout Items Common Options). To differentiate from editable variables, read-only variable names and values are displayed in italic. On the other hand, higher level variables overwritten by lower level ones are strike through. QGIS has the facility to store/retrieve authentication credentials in a secure manner. Users can securely save credentials into authentication configurations, which are stored in a portable database, can be applied to server or database connections, and are safely referenced by their ID tokens in project or settings files. For more information see Authentication System. 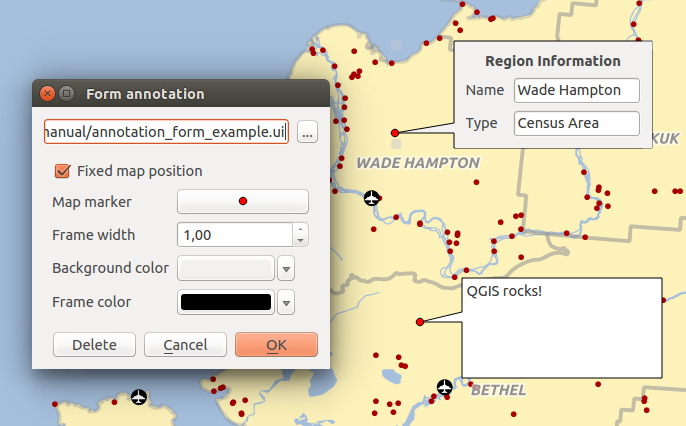 In QGIS, there are some options you’ll often have to work with. 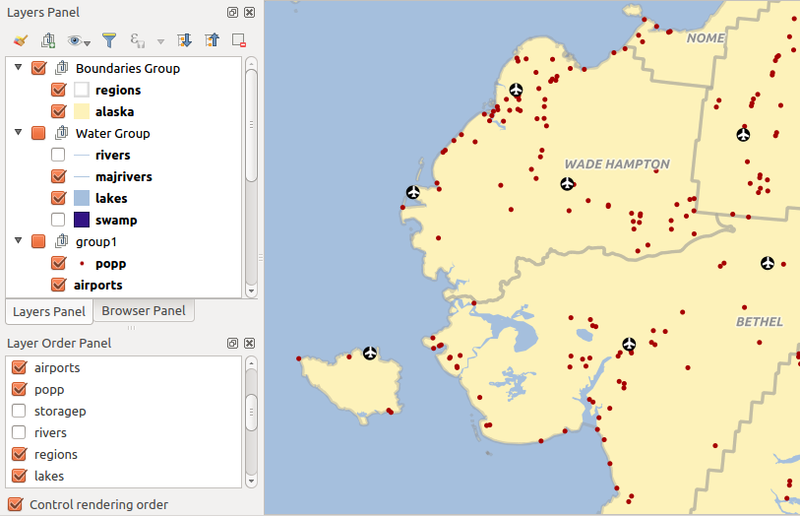 For convenience, QGIS provides you with special widgets that are presented below. The Select Color dialog will appear whenever you click the icon to choose a color. The features of this dialog depend on the state of the Use native color chooser dialogs parameter checkbox in Settings ‣ Options… ‣ General. 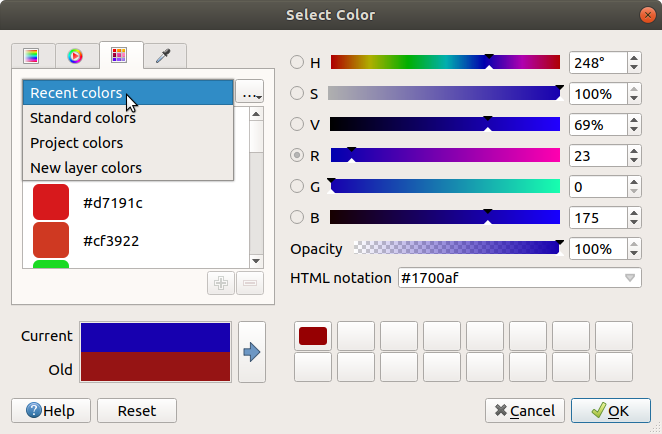 When checked, the color dialog used is the native one of the OS on which QGIS is running. 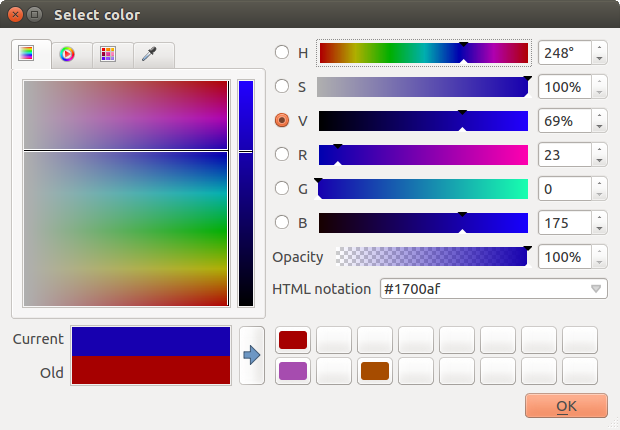 Otherwise, the QGIS custom color chooser is used. 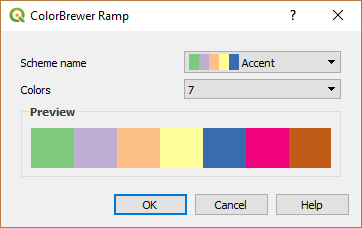 The custom color chooser dialog has four different tabs which allow you to select colors by Color ramp, Color wheel, Color swatches or Color picker. With the first two tabs, you can browse to all possible color combinations and apply your choice to the item. 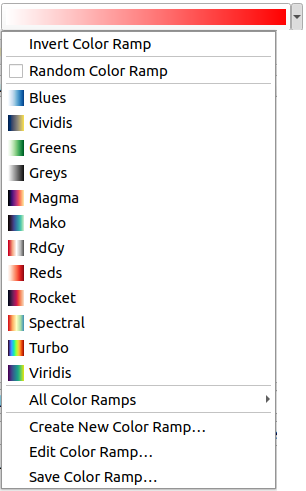 In the Color swatches tab, you can choose from a list of color palettes (see Colors Settings for details). All but the Recent colors palette can be modified with the Add current color and Remove selected color buttons at the bottom of the frame. Another option is to use the Color picker which allows you to sample a color from under your mouse cursor at any part of the QGIS UI or even from another application: press the space bar while the tab is active, move the mouse over the desired color and click on it or press the space bar again. You can also click the Sample Color button to activate the picker. Whatever method you use, the selected color is always described through color sliders for HSV (Hue, Saturation, Value) and RGB (Red, Green, Blue) values. The color is also identifiable in HTML notation. Modifying a color is as simple as clicking on the color wheel or ramp or on any of the color parameters sliders. You can adjust such parameters with the spinbox beside or by scrolling the mouse wheel over the corresponding slider. You can also type the color in HTML notation. Finally, there is an Opacity slider to set transparency level. The dialog also provides a visual comparison between the Old color (applied to object) and the Current one (being selected). Using drag-and-drop or pressing the Add color to swatch button, any of these colors can be saved in a slot for easy access. Drag-and-drop a color selector widget onto another one to apply its color. Color ramps are a practical way to apply a set of colors to one or many features. Their creation is described in the Color Ramp section. As for the colors, pressing the color ramp button opens the corresponding color ramp type dialog allowing you to change its properties. Lighten: This selects the maximum of each component from the foreground and background pixels. Be aware that the results tend to be jagged and harsh. Screen: Light pixels from the source are painted over the destination, while dark pixels are not. This mode is most useful for mixing the texture of one item with another item (such as using a hillshade to texture another layer). Dodge: Brighten and saturate underlying pixels based on the lightness of the top pixel. Brighter top pixels cause the saturation and brightness of the underlying pixels to increase. This works best if the top pixels aren’t too bright. Otherwise the effect is too extreme. Addition: Adds pixel values of one item to the other. In case of values above the maximum value (in the case of RGB), white is displayed. This mode is suitable for highlighting features. Darken: Retains the lowest values of each component of the foreground and background pixels. Like lighten, the results tend to be jagged and harsh. Multiply: Pixel values of the top item are multiplied with the corresponding values for the bottom item. The results are darker. Burn: Darker colors in the top item cause the underlying items to darken. Burn can be used to tweak and colorize underlying layers. Overlay: Combines multiply and screen blending modes. Light parts become lighter and dark parts become darker. Soft light: Very similar to overlay, but instead of using multiply/screen it uses color burn/dodge. This is supposed to emulate shining a soft light onto an image. Difference: Subtracts the top pixel from the bottom pixel, or the other way around, in order always to get a positive value. Blending with black produces no change, as the difference with all colors is zero. Subtract: Subtracts pixel values of one item from the other. In the case of negative values, black is displayed. Next to many options in the vector layer properties dialog or settings in the print layout, you will find a Data defined override icon. Using expressions based on layer attributes or item settings, prebuilt or custom functions and variables, this tool allows you to set dynamic values for parameters. When enabled, the value returned by this widget is applied to the parameter regardless of its normal value (checkbox, textbox, slider…). Description… that indicates if the option is enabled, which input is expected, the valid input type and the current definition. Hovering over the widget also pops up this information. Store data in the project: a button allowing the property to be stored using to the Auxiliary Storage Properties mechanism. Field type: an entry to select from the layer’s fields that match the valid input type. An entry to list the Variable available. Edit… button to create or edit the expression to apply, using the Expression String Builder dialog. To help you correctly fill in the expression, a reminder of the expected output’s format is provided in the dialog. Clear button to remove the setup. When the data-defined override option is set up correctly the icon is yellow or . If it is broken, the icon is red or . You can enable or disable a configured data-defined override button by simply clicking the widget with the right mouse button. 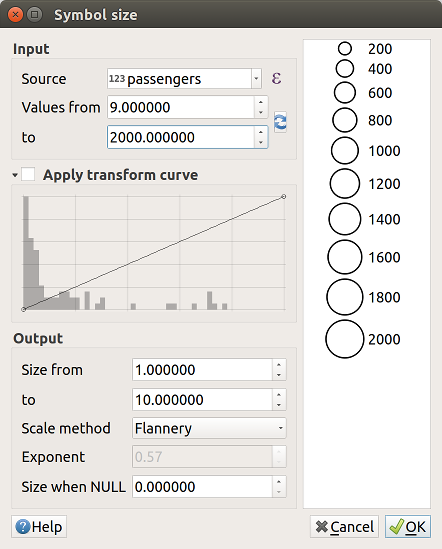 Apply transform curve: by default, output values (see below for setting) are applied to input features following a linear scale. You can override this logic: enable the transform option, click on the graphic to add break point(s) and drag the point(s) to apply a custom distribution. When compatible with the property, a live-update preview is displayed in the right-hand side of the dialog to help you control the value scaling.